Slide is a newly open restaurant on Bleecker Street in the West Village, specializing in Sliders (What else?) 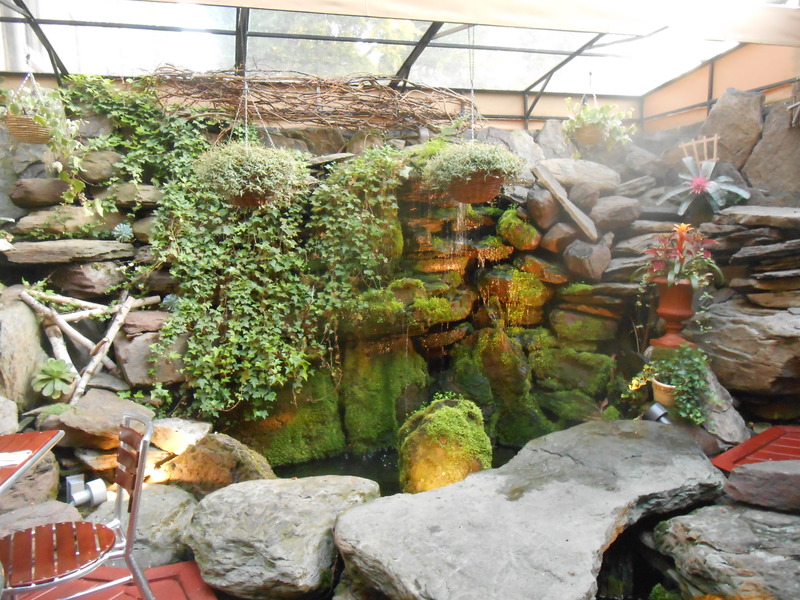 My friend and I ate in the outdoor beautiful garden-like area in the back which had hanging plants & flowers, a rock wall with waterfalls that cascade gently into a pond with koi fish! It was lovely and made us feel like we were not in the city, enveloped in this outdoor haven. 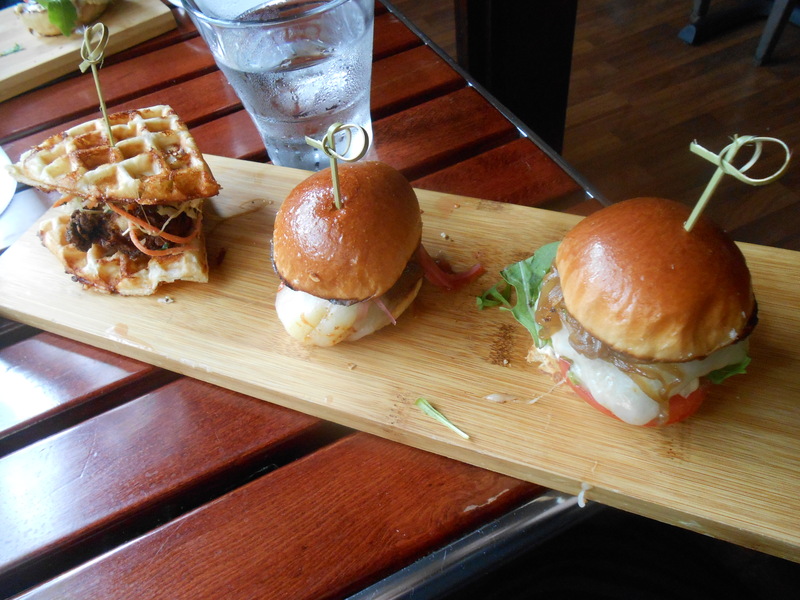 The sliders come three to an order, presented on a custom-made wooden cutting board with cylinders cut out to hold each individual mini burger. I decided to try a combination of different sliders: Classic beef slider, fried chicken with cheddar waffle, pork belly slider. The classic beef slider is made with a top secret meat blend that’s mixed in-house. 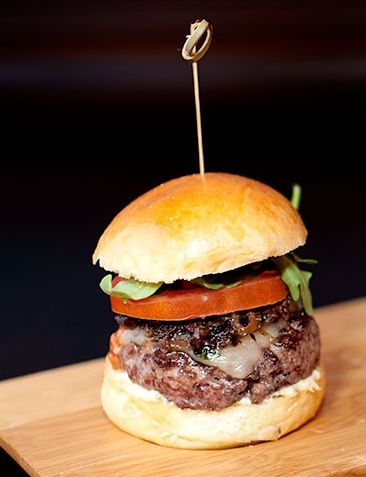 It came with Manchego cheese, plum tomato, arugula, remoulade and caramelized onions and is delicious. The meat was perfectly juicy, flavorful, tender and all the flavors combined perfectly to create a wonderful culinary experience. The buttermilk fried chicken & cheddar waffle w/ maple bourbon pear butter & spicy coleslaw was decent, but didn’t quite live up to my expectations. 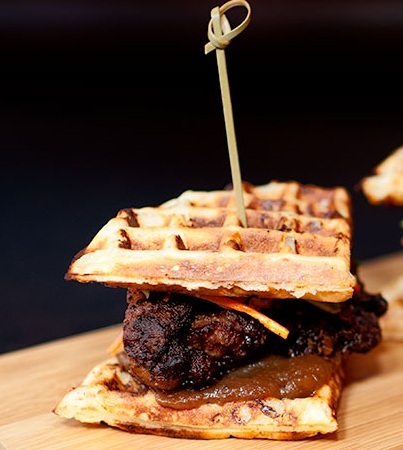 The fried chicken was not as seasoned as I would have liked; the waffle, though orange did not have a pronounced cheddar flavor and was too dry. I had to ask for syrup to moisten and sweeten the waffle. Also, I could barely taste the maple bourbon pear butter. Last was the BBQ pork belly slider, which I had reservations about but turned out to be quite good. It was made with Monterey Jack, pickled onions & fried brussel sprouts. I didn’t really taste the brussel sprouts, but the pork belly was crispy, and a slightly sweeter version of ribs. 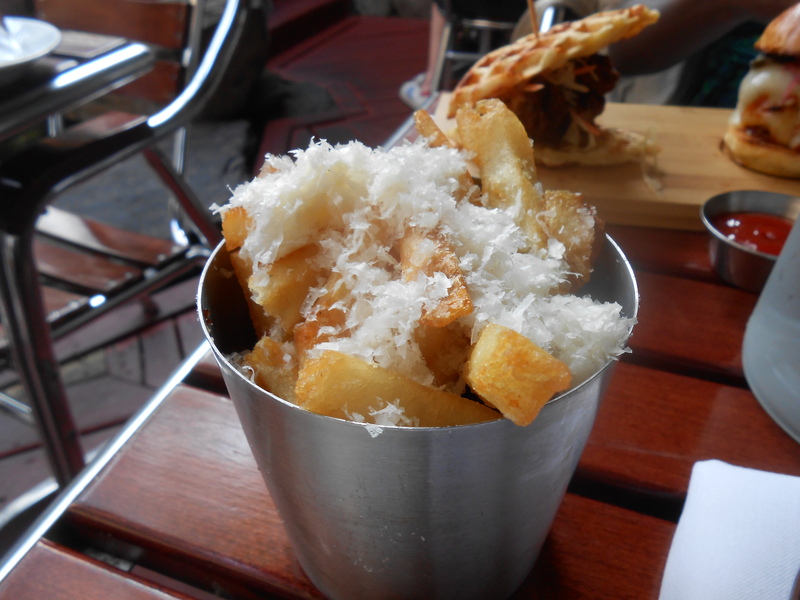 I also had Parmesan, garlic & herb fries, which came in a silver tin. They were pretty good, and had plenty of Parmesan shavings but not so much the garlic and herb. I would have enjoyed it more if the garlic and herb were mixed in and cooked with the french fries; instead it seemed like some Parmesan cheese was thrown on top and that was it. They also have curly fries cooked in bacon oil which dark chocolate shavings, which sounded delicious but a little too indulgent. Maybe next time. Also for next time I would like to try the CBLT -Crab cake with bacon; the bulgogi cheese steak; the lobster slider, as well as one of their shakes! Afterwards, my friend and I walked along Bleecker Street and kept passing amazing, tempting shops with posters, cheese, macarons, books, cupcakes… We stopped in a couple of the places. 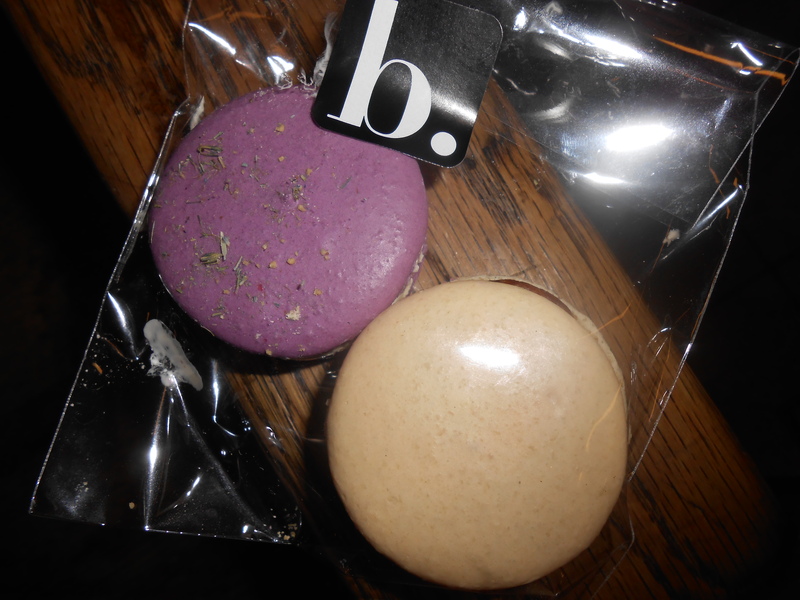 I ended up trying some of the macarons at bisous, ciao which had a clear white window exterior and white walls, accented with hot pink paneling and hot pink twinkle lights. I chose lavender + honey and gianduja, which is a classic mix of hazelnut and milk chocolate. The lavender + honey was truly delightful: Light, delicate flavor of lavender married with the sweeter, richer taste of honeysuckle cream. The chocolate one was surprisingly not as delectable, and was heavier, more dense and doughy with not enough hazelnut flavor.